Jackie Badenhorst is a wildlife photographer from South Africa with a deep love for nature, wildlife and adventure. She worked as a field guide in a number of private game reserves and still enjoys the thrill of tracking big game. Her love and addiction for the wild drives her to get out into the wilderness areas of Africa and abroad as often as she can. 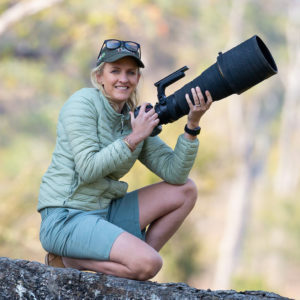 Wildlife photography is not only challenging and highly rewarding for her on a personal level but also means of conveying the beauty of these wild places for others to see, in the hopes that they may be conserved for generations to come.